An “official oracle” has spoken — or eaten, technically — and predicted victory for Russia. 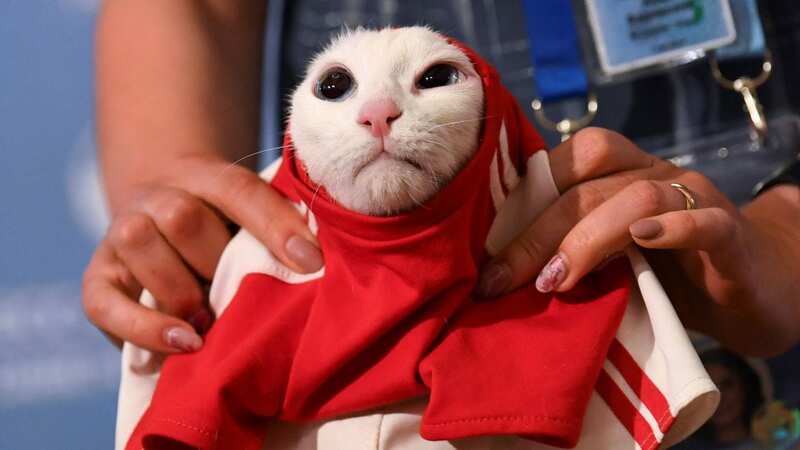 That was the news from St. Petersburg Wednesday after Achilles the cat picked Russia to win the opening match of the World Cup on Thursday in a game against Saudi Arabia. He picked between two bowls of cat food, and chose the one marked with the three colors of the Russian flag — “however not without hesitation,” according to Russia’s state-owned Tass news agency. The feline forecaster chose wisely — because the host nation wound up winning 5-0. Achilles is a white cat who lives in St. Petersburg’s Hermitage Museum — one of about 50 to 70 cats tasked with catching rats in the museum’s basement, Tass says. In 2017, Achilles correctly predicted three out of four matches in the soccer FIFA Confederations Cup, Tass notes. Achilles has been hard at work as of late to prepare for the World Cup. He’s been “training to shed weight and get more fit” over the past year, according to the news service. He’s deaf, which in this case is an asset as it “lets him better concentrate” without the distraction of people talking and camera noise during his press appearances. But more than 1,000 miles to the east in the city of Yekaterinburg, Spartak the lemur picked Saudi Arabia as the winner, Sky Sports reports. Achilles and Spartak are far from the first animal prognosticators. In the 2010 World Cup, Paul the psychic German octopus gained fame for (correctly) predicting winners by eating out of one of two glass jars bearing the flags of competing countries. And a few months ago, NPR gave a thorough rundown on all the animal predictions for Super Bowl LII. A complex post-game analysis shows the elephant, hippo, sloth, panda and eagle chose wisely. Beware when taking advice from dolphins, giraffes and puppies — each chose incorrectly.